Beaumaris and the wider Sandringham district – including Half Moon Bay – are home to spectacular outcrops of highly weathered Iron-rich Cenozoic (young) sandstone. This part of the coast is littered with beautiful beaches and seascapes for walkers and swimmers alike. The area first became interesting to Palaeontologists, however, in the early 1970s when a young researcher found an articulated section of an extinct seal whilst snorkelling… a young researcher called Tim Flannery, no less! Below the sea cliffs and out to see are much older Silurian rocks – that’s a 350 million year old time gap (see the geological time scale above)! We call this time gap an unconformity. Unconformities generally represent significant periods of deformation (folding, mountain building) or erosion (sea level variations). In this case, it’s both – mountains were built and then weathered away with the formation of Port Phillip Bay. Figure 1: Map of Sandringham District highlighting the major anticlines and synclines (NNE-trending) and Beaumaris Monocline, as well as location of Figure 2 (cross-section). The cliffs at Beaumaris are now renowned world-wide for the incredibly rich and diverse marine fossil assemblage. This includes Megascyliorhinus (shark), numerous shark teeth, seals, whales, penguins, albatross, turtles and even Diprotodonthids (the largest marsupials ever known!). In an earlier post which explores Werribee Gorge, folds – or more specifically ‘antiforms’ and ‘synforms’ – were explained and demonstrated in the field. Beaumaris, however, is an example of a ‘monocline’ (see diagram below). This means that the stratigraphy here is elevated, allowing us to see sedimentary layers at the cliff base which are usually only visible to divers. 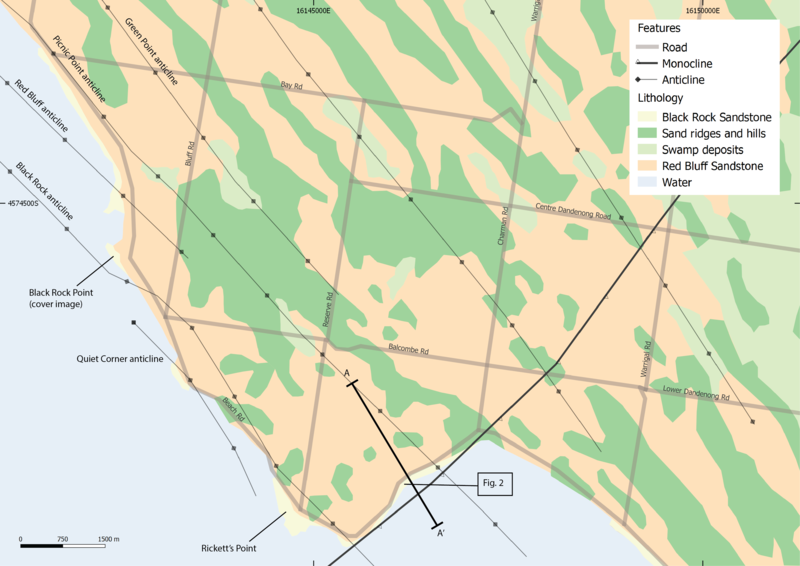 If you look carefully in the map above you will notice that popular beaches like Half-Moon Bay occur in the easily weathered synclines (Red Bluff Sands), and the anticlines – which jut out of the cliff – occur in the position of the anticlines. It is this thin gravelly layer at the base of the Black Rock sandstone – the Fyansford Formation (~10 Ma) – that fossickers flock to Beaumaris for. It is the oldest layer exposed in the Sandringham District (Miocene). The thin layer has yielded a large range of vertebrate fossils including shark teeth and, seal, whale and penguin bones. The waters in the Miocene (at the time of deposition) were warm, the culmination of a world-wide marine transgression (rising seas). 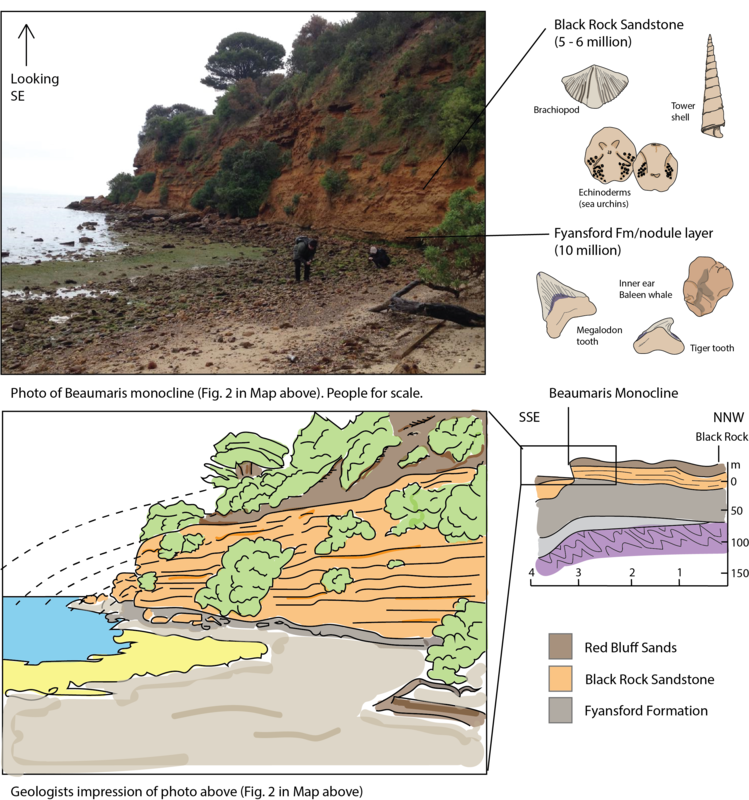 This fossiliferous layer also outcrops at Fossil Beach in the Mornington Peninsular. Lying above the Fyansford Formation is the Late Miocene Black Rock marine sandstone (5-6 Ma). It is well exposed along many of the cliffs between Point Ormond and Mentone. The base of the sandstone consists of phosphatic and limonite nodules as well as vertebrate remains (e.g. teeth, vertebrae, ribs, ear bones). Higher up, the beds contain fossils of molluscs, brachiopods, echinoderms, corals and crustaceans. Echinoderms (sea urchins), specifically lovenia forbersi, are particularly common finds. Spectacular cliffs at Half Moon Bay. Above this is the Red Bluff Sands (Miocene). This layer comprises non-marine clayey sands and gravels, and outcrop over a wide area of Melbourne. At Black Rock, only ~3 m of this layer is exposed, whereas at Beaumaris ~15 m is visable. It also contains terrestrial marsupial fossils including Diprotodon and Zygomaturus. The top layer of the stratigraphy (road level) is comprised of surface soils and swampy dune sands (Holocene and Pleistocene). Drawing of Australian Megafauna (by Peter Trustler). The diprotodon, of which jaw bones have been found at Beaumaris, is the giant wombat in the center. For a more comprehensive list of fossils which can be found at Beaumaris, this guide from Museum Victoria is incredibly helpful. Erich Fitzgerald, as curator of Vertebrate Palaeontology at Museum Victoria, is one of a number of eminent scientists working at the site. Access to the location of Figure 2 at Beaumaris is just down the driveway of the Beaumaris Motor Yatch Squadron, at the intersection of Banksia Ave. and Beach Rd.